Steven Spielberg Has Some Ideas For "Jurassic 4"
When it comes to the legacy of a fourth Jurassic Park movie, there have been fake scripts, weird rumors about dinosaurs with guns, and loads of fan-created art that have all amounted to squat. But according to The Hollywood Reporter, Steven Spielberg has been meeting with screenwriter Mark Protosevich (Poseidon, I Am Legend) to put a fourth installment into motion. After Jurassic Park creator Michael Crichton passed away in 2008, it was believed that the film series would be left at three, and rightfully so. 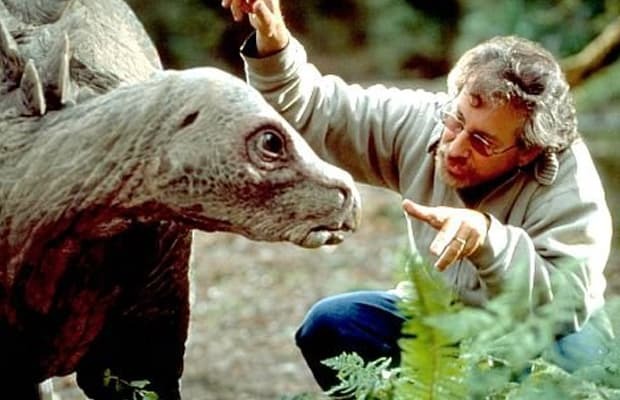 Maybe Spielberg got the itch to play with dinosaurs again since developing his new Fox sci-fi series Terra Nova? Either way, both Universal and Spielberg&apos;s reps aren&apos;t refuting the rumor, though making sure to stress the fact that no script is in the works. It&apos;s been ten years since the last film in the series, and the last time Spielberg and Protosevich worked together was on the proposed remake of Chan-wook Park&apos;s Oldboy (said to star Will Smith, and, thankfully, now on the backburner). Honestly, the only thing we need less in this world than another Jurassic Park 4 is Indiana Jones 5, and since we can&apos;t stop them from making that one, the least Spielberg can do is let the dinosaurs stay extinct. What do you think?